If you're looking for a present that will leave your loved one rendered speechless, personalized gifts are the answer. No matter what special occasion or milestone is being celebrated - new parents, children's birthdays, Valentine's Day, Anniversaries or thank yous - nothing speaks to the heart as much as a tailor made gift. Not only is it more personal, but it's thoughtful, exclusive and has that element of surprise. Catch your friend or family member off guard - create a personalized gift now. 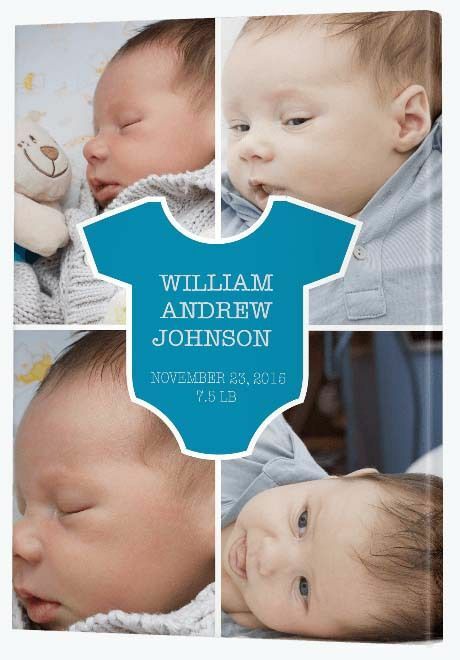 Personalized photo gifts for babies are the latest in innovation, with a creative result that makes everyone go 'Aww'. 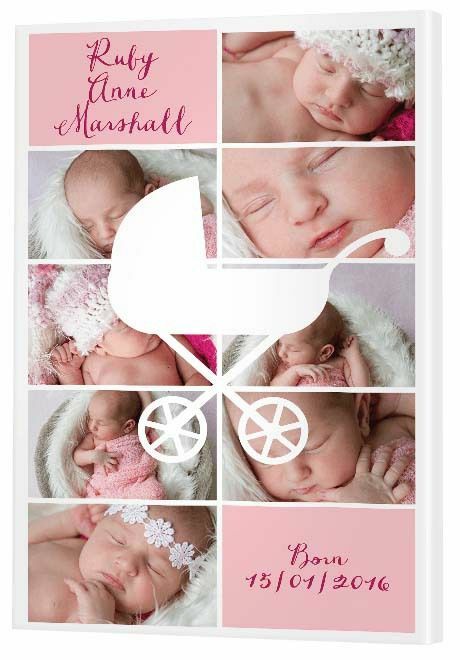 This baby carriage collage, from our Silhouette collection, is enhanced even further by adding two individualized panels featuring the baby's name and her birth date. While this pastel pink is ideal for a baby girl, you can make these panels any color you choose. If you're a graphic designer (or know one!) you can design the panels using Adobe Photoshop. Alternatively, if you're not a graphic designer, Canva is your new best friend. Create a design in Canva that matches the shape of the photo frame on the collage. Choose a plain pink background, add your text then - for the highest resolution - download 'PDF: To Print'. Convert your PDF to a .jpg or .png then upload it to the Canvas Factory Canvas App. Alternatively, email the PDF to us at [email protected] with instructions on where it needs to go on your collage and we'll look after it for you. It may sound tricky at first, but once you get the hang of Canva, you'll be a graphic wizz in no time. Their baby boy won't be little for long, so precious moments must be celebrated with the most adorable gift you can find. This archangelic, personalized baby romper collage wins all the cute baby boy gift awards. Available in our modish collection, the design is perfect for a custom name and birth date. To create this image, choose a square design from Canva and leave plenty of color around the text. Once you've downloaded it and converted it to a png or jpg, you'll be ready to place it on the frame. 1. Go to 'Create A Canvas' on the Canvas Factory website. 4. Select the Modish 11 shape. You're now ready to upload your photos. Find the image you've just created, place it onto the romper shaped frame and use the zoom tool to perfectly position your personalized text. If you want to make this a surprise, find the baby photos to use from their Facebook or Instagram page (you know there's already a million!). Upload these and you're all done. Easy isn't it? While this idea is great for the boy (or girl!) who loves dinosaurs, the trick is to know the thing they delight in the most and personalize it to suit. 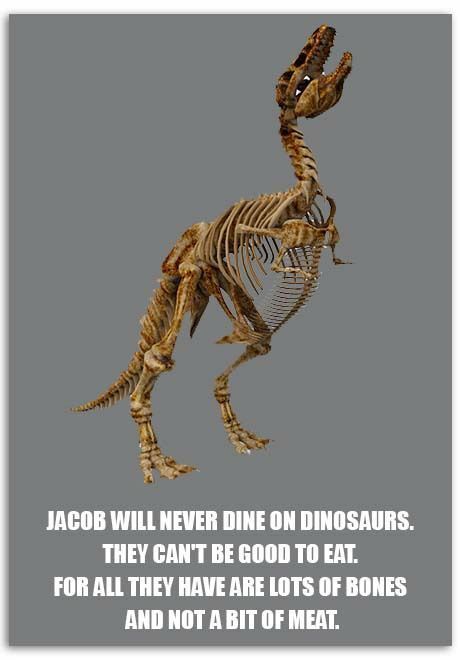 Do they love dinosaurs? Perhaps robots? Or trucks? Think about what the little boy in your life loves and create a personalized print around it. Hop online, Google some short poems then adapt them to include his name. To create this custom design, visit Canva and select the Magazine design under 'Documents'. This is their highest resolution option. Once you've clicked into it, scroll down to the blank templates and create your own free design from scratch. Upload your photo into Canva then add the text using the Text tool. You can type anything you like and choose any color text. When downloading the image, be sure to select 'PDF: For Print' as it will give you the highest resolution image possible. Rather than using the Canvas App as you normally would, email the PDF to us at [email protected]. For extra impact, we'll print it for you onto a single, spectacular brushed aluminum print. Encourage her love of dance with a work of art that celebrates her hard work and talent. A personalized canvas wall display is a perfect gift for a young girl who is already very passionate about a hobby. In this case, it's ballet, but it could be any activity at all - any sport, musical instrument or performance art. 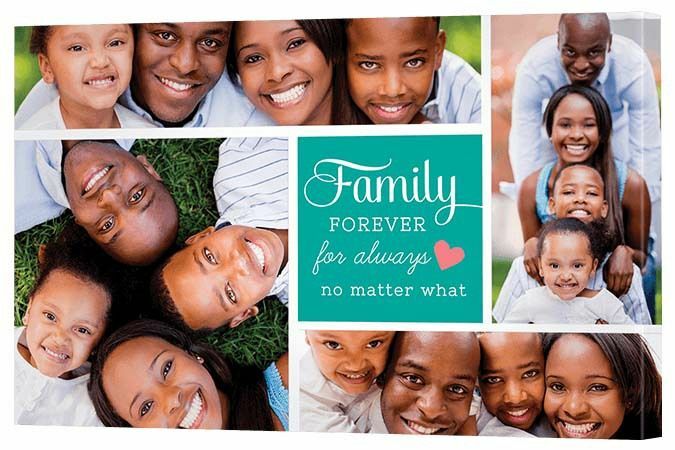 Featuring one 26" x 26" (65 x 65cm) panel and 12" x 12" (5 30 x 30cm) panels, this gift gives you the opportunity to gather five of the best photos taken of the talented star over the last year to create a wonderful photo display. The largest panel can then be used to include a gorgeous personalized image that acknowledges her by name. This gift makes a wonderful interior design for a girl's bedroom and an inspiring art piece to spur her efforts forward, day in day out. 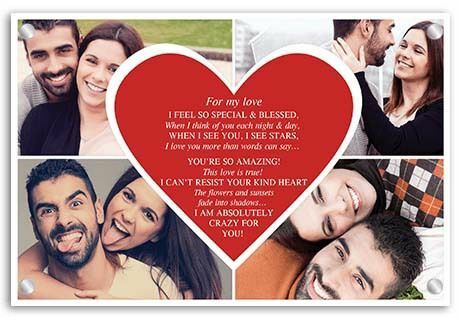 Make your lover's heart sing with a creative glass collage of photos and a personalized poem. It doesn't take much to win the heart of a loved one on Valentine's Day - it just takes some thought and planning. Find a poem that suits your love's personality and, of course, your own feelings. If you're stuck for words, Google is a great place to start, but if you're feeling creative, have a go at writing something yourself. Add some photos of the two of you together and, Voila! Reflect on 40 or 50 years of marriage in style, with a heartfelt collage that celebrates the precious moments of yesteryear. This could be a gift from one spouse to another or it could be something special created by the family for the happy couple to acknowledge this incredible milestone. Either way, the idea is the same. Gather photos of the couple from when they first met through to the present moment. Don't just include photos of the couple, but photos of their lives together including special milestones and family memories. The text frame we've included is just one idea. You can customize your own text using Canva. You can write absolutely anything - let your imagination take over or adapt this formula to suit. Simply create a design to match the portrait shape of the frame then download 'PDF: To Print' to produce a high resolution image. You can either convert the PDF to a .jpg image yourself and create the collage using our Canvas App or email the image to our customer support team. We're here to help! Never forget that wonderful family holiday again, with this thoughtful birthday gift idea. Despite being so easy to design, this canvas is one of the most thoughtful personalized presents you can give a happy traveler. 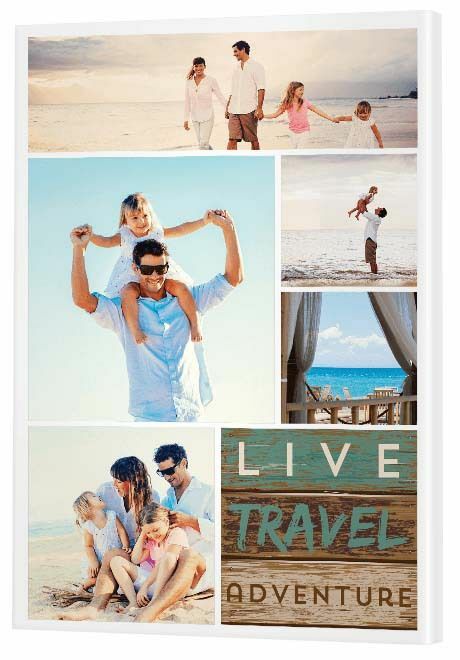 Recall the good times again and again with this travel themed collage, a wonderful wall hanging for the office. Inspire someone to treasure those precious moments in life or to save for that next amazing holiday. This could be the ultimate gift for that person in your life who has a tendency to focus on work, work, work; it's a constant reminder that there's more to life. Source photos from the family camera or raid their Facebook or Instagram page. Make sure the photos are all high resolution, particularly if you want to make it a large canvas. If the images aren't suitable, we'll let you know but getting good quality digital images makes it quicker for us to get the gift to you. Afterall, that's what life should be about. Thank your favorite pet sitter for looking after your furry family with a stunning personalized pet print. They have cared for your pets as if they were their own, so it's only appropriate to thank them in the same way. 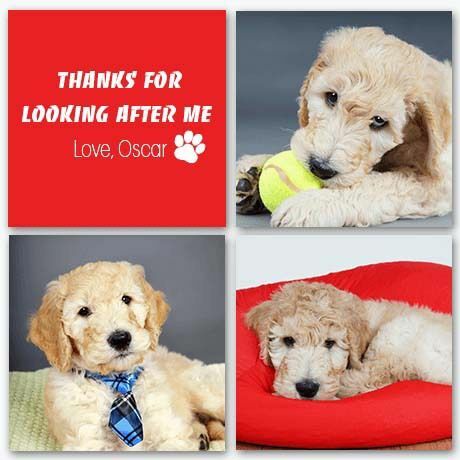 This cute as pie personalized pet wall display gives Oscar the dog three opportunities to express all his cuteness. The fourth frame is reserved for a customized thank you, from Oscar himself. "Thanks for looking after me. Love Oscar." With a gift as gorgeous as this, all will be forgiven - the barking at the thunder, the chasing of the neighbour's cat, the pooing upon every visit to the dog park. Surprise your newly wed with a personalized gift she will insist on hanging in the best place in the home. As we progress further into the 21st Century, weddings are becoming more and more diverse, with magical touches that leave tradition far behind us. 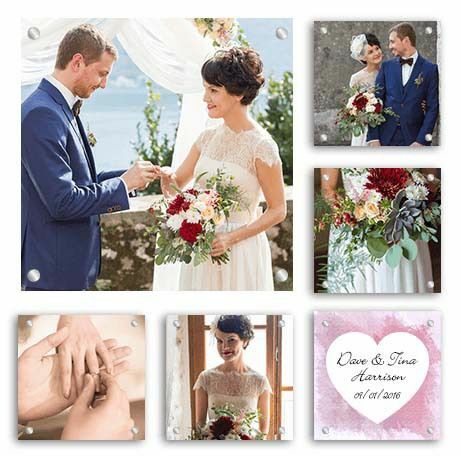 Celebrate your love with a stunning glass wall display. You spent a lot on that special day (or not!) and now it's time to transform those treasured digital images into a special gift of love you can both enjoy. 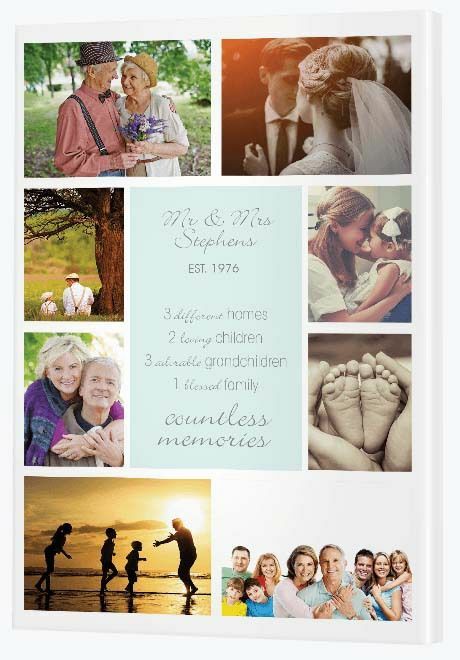 Top it off by making one panel a customized reminder of that special time. You can use Canva or design something yourself in Adobe Photoshop or Gimp. You can include anything you like, but including your names and your wedding date provides a special touch. A beautiful gift for the Christian in your life who deserves a precious reminder that God is watching over them. 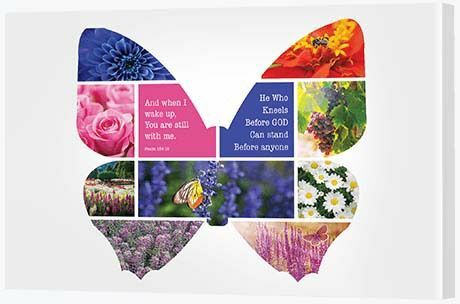 Here we use a butterfly silhouette collage full of joyful floral photos and use two of the panels to include some quotes from the bible. Pinterest is a wonderful source for some of the most contemporary quotes, but if you have a favorite be sure to use that instead. We used Canva to design two different images: one a square pink and one a square purple. We downloaded it as a PDF: For Print, converted it to a .jpg then uploaded it to the Canvas Factory Canvas App.